Aren’t you glad someone shared the Good News of Christ with you in a way you could understand? Maybe you were a child and that person put it in words a child your age could understand. You might’ve been an uninterested teenager or a doubting adult and the person who connected with you did so in a way that didn’t turn you off. Aren’t you glad he or she didn’t begin, “Για Έτσι ο Θεός αγαπούσε τον κόσμο: έδωσε ο μοναδικός γιος του...”? Unless you know Greek, you’d never guess you were hearing, “For this is how God loved the world: He gave his one and only Son...” (John 3:16)! And get this: those words sound like Greek to most folks! I remember one occasion I was having lunch with an unbeliever, a well-educated physician and friend. As we ate, I drew a chart on my napkin to illustrate how the death and Resurrection of Jesus enable us to cross from life without Him on earth to eternal life with Him. Each of us, I explained, has a long record as a sinner. We can’t make up for the wrongs we’ve done. In fact, it would be fair if God gave up on the whole lot of us! But instead, He embraces us, just as we are. The penalty for sin is death—but even when we’re alive, we’re not really living if we don’t know God. So because He loves us so much, God sent His Son, Jesus, to pay for our sins and give us true life. To be right with God and really live, to have your slate wiped clean forever, ALL you have to do is trust in Jesus. It’s God’s FREE gift! Our lunch together drove home an important truth: the Gospel is foolishness to those who don’t believe (1 Corinthians 1:18–21). That’s why we must keep it simple and accessible to all. We learn from Jesus how to do that. Jesus accepted people just as they were. Lawyers, beggars, tax collectors, politicians, streetwalkers, victims of demons, grieving parents, even an inquisitive Pharisee after dark—all got equal time. Jesus could’ve blown them away with the depth of His knowledge! But He stayed on their frequency...and they hung on His every word. Jesus was the epitome of relevance, acceptance, humility, and love. It’s we who have confused the Gospel, adding our religious trinkets and gimmicks! It’s time for us to talk about the death and Resurrection of Jesus so that anybody can understand and everybody has the opportunity to respond. 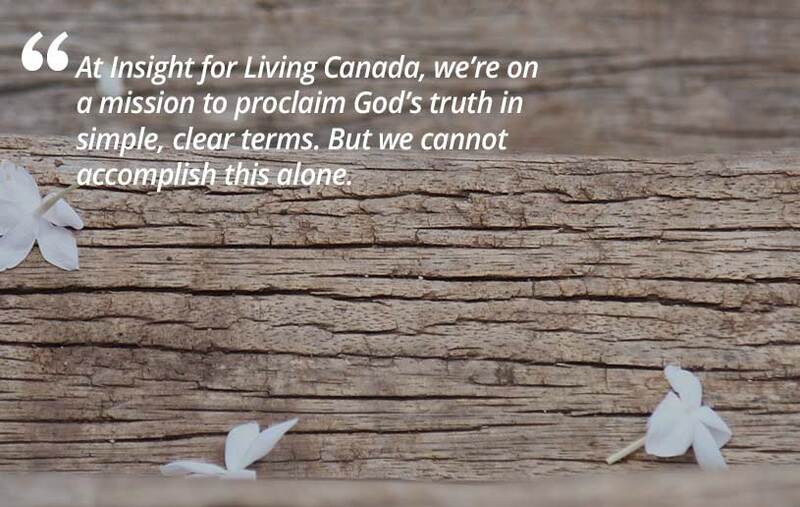 At Insight for Living Canada, we’re on a mission to proclaim God’s truth in simple, clear terms. But we cannot accomplish this alone. Will you join our mission? You can help someone understand the Gospel, just as you have, by sending a generous gift to Insight for Living Canada today. The message of the cross is too good to confuse it. Let’s proclaim it clearly, and let’s do it together!